The Clark Library invites all University community members to join University president Rev. Mark L. Poorman, C.S.C., in a blessing ceremony for the new Dr. James T. Covert Gallery on Thursday, October 11, at 3:30 p.m., in the library. 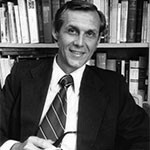 Jim Covert had a long and influential career on The Bluff as a history professor from 1961 to 1997. He passed away on October 13, 2016. The new gallery is intended to help keep his name and legacy alive at the school he loved. Please RSVP to giving.up.edu/covertgallery. Questions? Contact Diane Romero, library, at x7775 or hicksd@up.edu.